Hundreds of lives could be saved if patients with hip fractures were operated on in under 24 hours, a new study reveals. Researchers in Bristol found 8% more patients died after 30 days if they were operated on between 24 and 36 hours after admission to hospital. Data was collected by a team at Southmead Hospital from the National Hip Fracture Database, the largest such list in the world. The study focussed on 241,446 patients across England and Wales who were admitted to hospitals with hip fractures between January 2011 and December 2014, and the mortality rate for these patients 30 days after they were admitted. Guidance issued by the National Institute for Health and Clinical Excellence in 2011 called for patients to be operated on either the same day, or the day after, hospital admission. But the new report says that even earlier surgery can improve outcomes for elderly patients who are often frail, with multiple medical problems. "We found 8% more patients died if they were operated on between 24 and 36 hours compared to those given surgery within 24 hours, and the risk increased to 20% for those receiving surgery after 48 hours," said Adrian Sayers, the lead author on the paper. 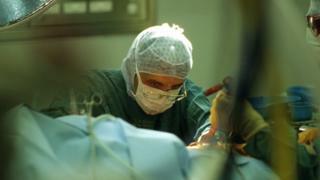 Timothy Chesser, the clinical lead of the research project, said early surgery was not advisable for every patient, but was beneficial in the majority of cases. "We have shown for the first time that early surgery is much better for patients," he said. "The caveat is some of these patients are very sick and would benefit from greater time to get better before surgical procedures."